When it comes to exercise the best way to track your caloric expenditure is with a heart rate monitor. Although there are plenty of new activity trackers that feature built-in heart rate monitors, the chest strap is still the most popular accessory next to the sports-watch. For years Polar has held a strong position selling their H7 chest strap, though recent years they’ve seen some healthy competition from Wahoo Fitness with their TICKR lineup. 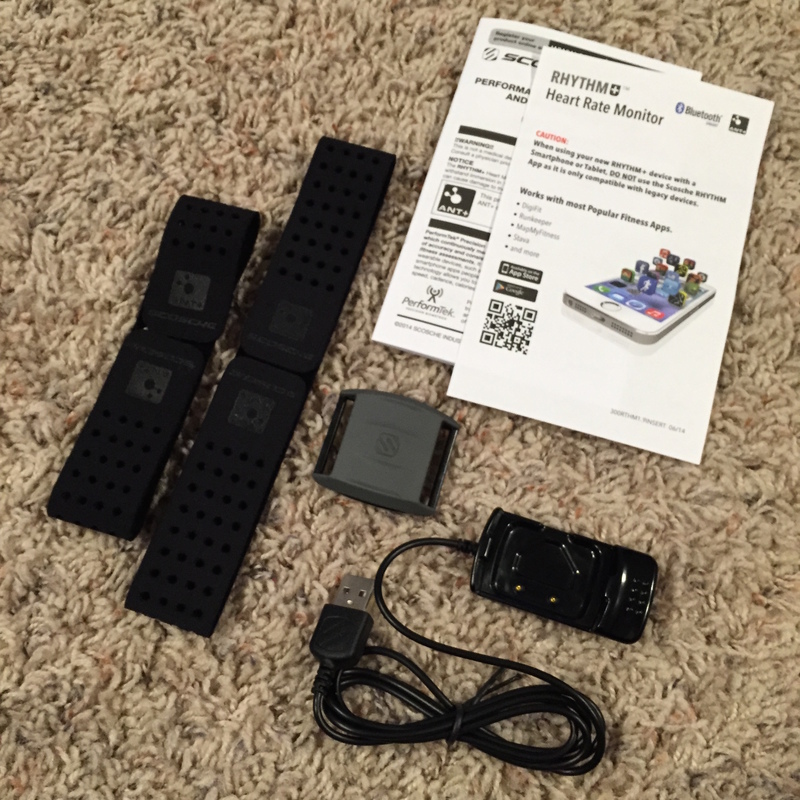 And now companies like Scosche have their second generation optical arm sensor, the RHYTHM Plus. Keep reading to learn how they compare. When I first started using a heart rate monitor to workout it was with the Polar H7 Bluetooth Smart Heart Rate Sensor. Eventually my wife stole that unit off me for her workouts. Then we both upgraded, me to the Wahoo TICKR Heart Rate Monitor, and her to the more advanced Wahoo TICKR RUN. Please be sure to read my full comparison & review of those sensors RIGHT HERE. 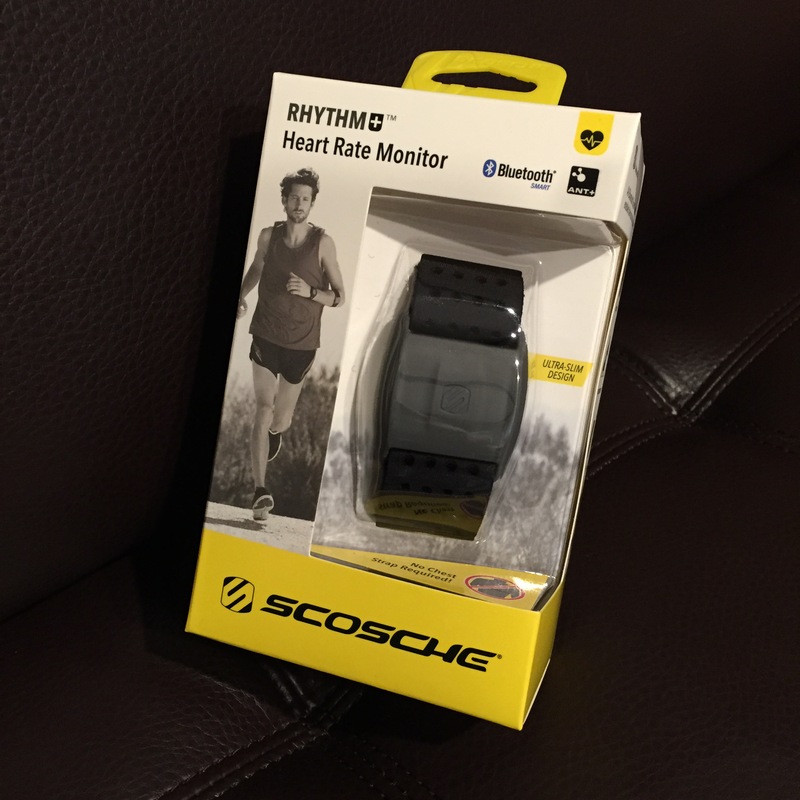 Since I’ve already put the Polar & Wahoo units through their paces, this review will focus on the Scosche RHYTHM plus Heart Rate Monitor. From my past review and experiences I’ll draw comparisons against the two heart sensors that my wife/I are still in possession of, and continue to use. Enjoy! I’ve had countless people tell me they don’t find wearing a chest strap heart monitor comfortable. And that always surprises me, as The Wife and I have talked about this extensively and we both agree that within 60-seconds of our workouts, the strap is completely unnoticed. I’m wondering if perhaps these people are wearing the strap too tightly? Either way, the Polar H7 and Wahoo TICKR line of devices have been great for us here at our home, and we find they are enjoyable to use, and provide excellent feedback. Especially her TICKR RUN unit, with its running metrics recorded. Still, it can be a bit of a hassle to put on a chest strap. You have to remove or hike up your shirt, which for females could definitely cause a privacy concern. And if your clothing is super tight that adds a complexity. Wearing an arm band would be easier to slide on/off, I’ll admit to that. Which is where the Scosche RHYTHM plus Heart Rate Monitor hopes to win your heart over (see what I did there?). Included in the box are two straps of varying lengths for people of various arm sizes. Then you also get the unit itself, a charging cradle with USB cable, and some paperwork. It was interesting to note that they claim the legacy Scosche app doesn’t work here, and that you’ll need to use a third-party app. I’ve been really happy with the iOS Wahoo Fitness App and since it works with whatever sensors you want, that is what I used for my testing. It also gave me a linear experience compared to my Wahoo TICKR device. Compared to the Wahoo hardware, the Scosche is also sweat-proof/resistant, though the Scosche is IP67 rated. Both support ANT+ and Bluetooth protocols. Sadly the Polar H7 lacks the ANT+ capabilities here, should you require that for legacy equipment or a Garmin device. Battery life on the RHYTHM+ is rated at a paltry 8-hours, but then again it can be easily recharged. Still, when you consider the two chest straps last the better part of a year without needing to replace the inexpensive battery it is hard to award the Scosche any bonus points. 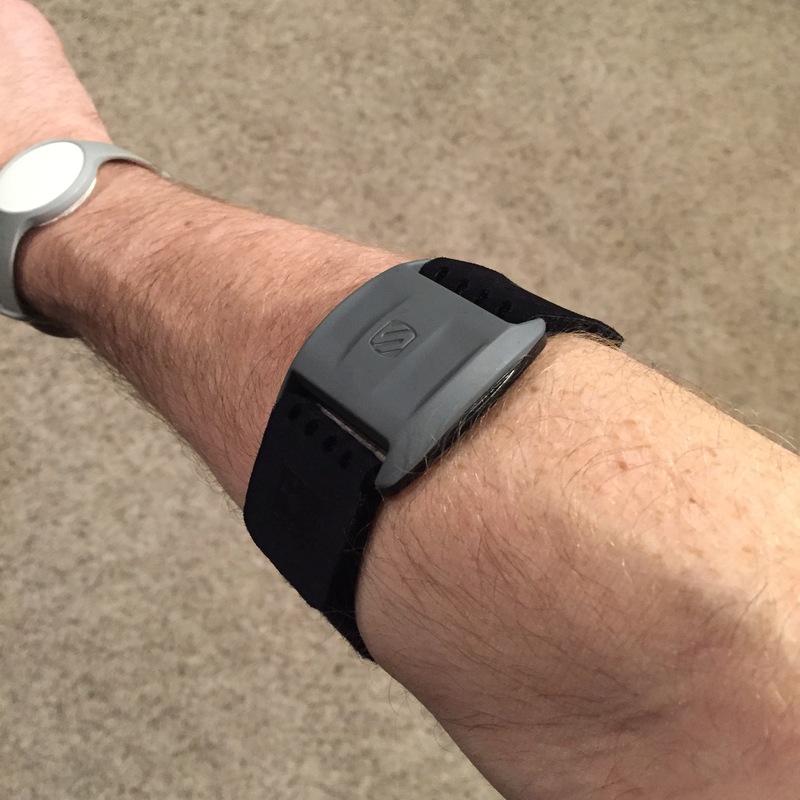 Wearing the Scosche RHYTHM plus wasn’t horrible, but I found the suggested placement (inside upper forearm) to be bad for two reasons. Firstly, my stationary bike is a Schwinn AirDyne that has moving arms, so the constant pumping of the handles caused my arm to flex a lot, making the band a bit uncomfortable for the long-haul. Secondly, because of the flex on my arm, getting a solid reading was difficult for the workout. I constantly found myself pausing the workout app to adjust the strap. Poor quality readings don’t come as a huge surprise, considering I actually tested the first generation Scosche unit some time ago. And at that time my results were similar: lack of comfort, lack of reliable readings. Not much has changed with the hardware, at least from a standpoint of straps and visuals. There are a few less buttons these days, and the device was marginally more comfortable to wear. But, for me at least, the chest strap was far more comfortable. And in my testing, it held a better heart rate signal than the other two chest straps. Optical heart rate sensors don’t have a great track record (read more here), even though more and more devices are starting to add that feature. I’ve also been testing the Basis Peak the past few days and have been wearing it where they suggested, just above the wrist. During the same workout it had similar reliability issues, dropping signal. When I would pause to adjust the Scosche RHYTHM plus I’d also adjust the Basis Peak as needed. I’ll have a small blog post about that device here soon, but let’s just say it didn’t leave me amazed. In the end my favorite heart rate monitors come from Wahoo Fitness. For the $59 price tag, the Wahoo TICKR is the best buy on the market today. Give the chest strap format a try, you won’t be let down. It is reliable, and comfortable to wear if you adjust it properly. If you’re a runner, the TICKR RUN is a nice upgrade. And those are the two devices I suggest for recording heart rate during cardio exercise. If you don’t want to use your smart phone during the workout, look at the TICKR X for a few more bucks. Ciao! I don’t know why a man might find chest heart rate straps uncomfortable, but as gal with I-cups, I don’t work out without a bra and that chest strap and bra never worked well together. Have you tried other sensors? My wife’s cup size isn’t quite as voluptuous as yours, but still up there, without any issues on the chest strap. Proper placement is paramount, but yes I’m sure it could be a problem depending. A good sports-bra might also help– have you tried that? I am more than pleased with my Tickr. Thank you for your suggestion. The next step is to have my HR displayed on my wrist while training, without paying for a bundle of features. Perhaps you are aware of just such a gizmo? Probably the best option for a wrist device that would display your heart rate monitor that supports that chest strap is the Vivofit2. It has amazing battery life, simple to use, and also will allow you step tracking data. You could spend $20-40 less for a basic running watch. But honestly I don’t think they are worth the cost these days. You’ll get so much more enjoyment from the Vivo devices. Here is what I would suggest below (link). Color and band options exist too. Ciao! I think the Rhythm is most reliable when you position the sensor on your inside forearm. The skin is thinner, less hairy and less sun-damaged there. There’s a reason they take blood from that area. HI! Great reviews as always. I’m wondering if you can comment further on this. I love my wahoo blue TckrX but like you find the data presentation lacking severely. I prefer to have it read through my digifit app. While the raw data is similar, the caloric estimation is easy way off. Which should I believe? I’ve entered in rhr and other data from the pro version tests that I think would estimate a better idea of what is really happening. I just feel like a fake when my digifit reads 700 calorie burn and my wahoo shows only 500. I ran across this from an earlier article of yours…. What is your take on the discrepancies? Regretfully, I don’t have a great answer for you. Heart rate is one of the best ways a casual user can get caloric burn data, but it isn’t the best way period– it is just the most common, and cost effective. If you google “Vo2 max” you’ll learn even more about how measuring oxygen is actually a more accurate depiction of exertion and in turn perhaps an even more effective way to determine your output. Heart rate isn’t great because someone who is more physically fit (but otherwise the same overall height/weight/age/gender) would actually have a lower heart rate to perform the same tasks — but does that mean they burned less calories? I can’t really say, I’m no expert there. Hi, thank you for the review. While I am not new to fitness, I am new to fitness tracking. I was wondering if you could answer a few questions for me. First off, I’ve read multiple complaints about the H7 having reliability issues. I’ve read stories of people going through 3 or 4 units in a year due to malfuntion/deterioration. Has this been a problem you’ve experienced or heard of with the Tickr? They are the same price on Amazon, and I would prefer the one that will last longer. Secondly, this may be a very dumb question but I just don’t know. About these Wahoo and Polar apps…do they require some other sort of fitness device to gather data? Or will my Android collect data during a workout on its own? I know the Tickr/H7 will have to be paired to the phone, but can you start and stop a routine from the phone and then look at the heart rate data gathered during that time period? Forgive me for the silly question. I really do appreciate your help. We had no reliability issues with our TICKR device from Wahoo. My wife used it for a few years without any problems. She has since moved to an Apple Watch (as I have, too). So if you’re looking for a solid device the hardware from Wahoo Fitness remains a top suggestion of mine. To answer your second question, you don’t need any extra hardware or apps. For example if you buy the Wahoo TICKR or similar, one single app on your smart phone is all you need to record the data during the workout. After you finish you can review the data. If you have a Fitbit or similar, sometimes people want to link those (or MyFitnessPal for example). If you have specific questions there let me know. But no other device beyond the HRM is required.